We're small but mighty to make a difference! Cardiovascular disease is a leading cause of death for Canadian men and women. As a matter of fact, every 7 minutes, someone in Canada dies from heart disease or stroke. Our team is riding the Heart&Stroke Big Bike to help change that. Will you help us by making a donation today? 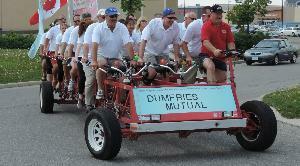 All of the money raised through Big Bike helps support the Heart and Stroke Foundation. Donations are used to help fund critical research that’s preventing heart disease and stroke, saving lives and supporting survivors and their families. That’s important because funding for research is in jeopardy. But we can ensure critical research continues. We are committed to protecting the privacy of your personal information. We may maintain a record of your interaction for donor-related, promotion and tax receipting purposes, where required. Occasionally, we may contact you with mission-related or program related communications. If you wish no further contact or have any questions or concerns regarding the privacy of your personal information, please contact the Chief Privacy Officer, at your provincial Heart and Stroke Foundation of Canada office at 1-888-HSF-INFO (473-4636) or through www.heartandstroke.ca/privacy-policy.